Again, the need to know your limits and pacing yourself are paramount. There is also the need to use proper body mechanics in order to minimize strain on the back . As in every physical activity, you need to develop a balance between strength, flexibility and cardiovascular fitness. So how do you survive the winter shoveling? When the snow comes, plan your efforts. Take whatever time it takes to do the job safely. Injuring your back or suffering a heart attack is a very real possibility and not worth the risk. 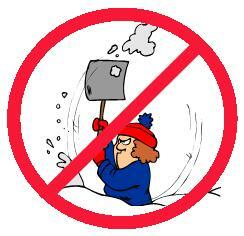 Along with not plunging the shovel into the snow with your arms, as mentioned above, do not throw the snow over your shoulder. Do not throw the snow by twisting your back to the side. Use your legs to turn toward the direction you will throw the snow, as mentioned above. Whenever possible, push the snow out of the way without lifting. Use an ergonomically designed shovel – great for pushing without the need to bend forward, due to its long and angled handle. Use a smaller shovel with long handle for digging. It is easier to work with small bites of snow when digging. Most importantly, PACE YOURSELF and watch your level of exertion. Yes, a snow blower makes the job very easy. However, there are always the steps and walkways where the snow blower won’t fit. The excerpt below is repeated from my article, titled “Raking Leaves Without Wrecking Your Back”. The same holds true for Snow Shoveling. Develop an appropriate balance of muscle strength, flexibility and endurance. Always do some warm up exercises prior to any yard work. This helps prepare the muscles for the onslaught of work. Stretching and flexibility exercises are best done to loosen muscles that have been worked and are still warm. They may however, be incorporated in your warm up if you feel tight before starting your work. Domenic Lopez B.Sc., LMT, ACSM CEP, is owner and operator of Healthy Moves, a private practice where massage therapy and movement education help you achieve better living.